The Columbus Zoo and Aquarium is saddened to report the loss of a Masai giraffe calf. Mother, Cami, began to exhibit signs of labor around 3 p.m. on Dec. 4 in a behind-the-scenes area of the Heart of Africa region at the Columbus Zoo. As Cami’s labor progressed, it became evident that the calf was presenting rear hooves first. Giraffe calves are typically born front hooves first, and it is extremely rare for calves to survive after being born rear hooves first. In order to do everything possible to save both mom and baby, the Columbus Zoo animal care team made the decision to enter the stall and turned off the National Geographic livestream cameras at approximately 4:50 p.m. to allow for the necessary intervention and to ensure that Cami and the calf’s health and safety were not compromised as a result. During the intervention, the zoo’s animal care team, as well as a large animal surgeon from The Ohio State University, attempted to manually extract the calf from Cami without success. They then performed an emergency Cesarean section at approximately 8 p.m. While Cami’s condition is currently stable, her prognosis remains guarded, and she will continue to be monitored around the clock by the zoo’s animal care experts. Cesarean sections in giraffes are extremely rare and typically conducted as a last resort due to the high risks involved in putting giraffes under anesthesia and successful recovery. After the calf was extracted via Cesarean section, the veterinary team found that the calf had serious congenital defects and thus would not have survived even if it had been born front hooves first. Cami, a 6-year-old female Masai giraffe, came to the Columbus Zoo in 2013 from the Nashville Zoo. Father, Enzi, is the 8-year-old breeding male Masai giraffe, and he arrived at the Columbus Zoo in 2013 after first being at The Wilds and the Toledo Zoo, where he was born. The pairing of Enzi with Cami was based on a breeding recommendation from the Association of Zoos and Aquariums’ (AZA) Species Survival Plan® (SSP) for giraffes. The news about Cami’s calf follows the loss of another Masai giraffe, Zuri’s, calf, Ubumwe, who sadly passed away on the morning of Nov. 17. Ubumwe was born on Oct. 30, and along with Zuri, was monitored around the clock by the animal care team. While regular wellness checks conducted by the animal health team had previously shown that she was growing and developing appropriately, Ubumwe’s behavior and appearance began to change on Nov. 16, and her health suddenly deteriorated. The zoo’s team of animal care professionals responded quickly, and aggressive treatment and diagnostics, including a CT, were performed to rule out potential causes of her gastrointestinal discomfort. Specialists from The Ohio State University were also available to conduct a comprehensive abdominal ultrasound and review the CT images. Despite intensive overnight care and some improvement in her clinical appearance, Ubumwe unfortunately passed away at approximately 8:30 a.m. At this time, the definitive cause of her death is still unknown until a full pathology report is received. In the meantime, Zuri has returned to the herd and is doing well. Nineteen giraffes had previously been born at the Columbus Zoo over the course of its history before the arrivals of Cami’s and Zuri’s late calves. The two most recent giraffe births are the first to have occurred in the Heart of Africa region since its opening in 2014. Giraffes typically have a gestation period of around 15 months and will give birth to the calf while standing up. Newborn calves can weigh anywhere from 100-150 pounds and are, on average, around 6 feet tall. According to the Association of Zoos and Aquarium, the mortality rate for giraffe calves in human care is about 25 percent while the mortality rate for giraffe calves in their native range is over 50 percent. Scientists also estimate that only a quarter of giraffe calves reach adulthood in their native ranges due to a variety of threats. “The loss of any animal is heartbreaking to the Columbus Zoo’s devoted animal care and animal health teams, particularly two whose births were as anticipated as these giraffe calves’. Despite the sad outcome, I am proud of our caring professionals for the great measures they took to try to save both Ubumwe, as well as Cami’s calf. Many animals, including giraffe calves, are extremely vulnerable when they are born—both in their native range and in human care. While we certainly understand the potential challenges, our team remains proactive, vigilant, and prepared to assist Cami however necessary. We are grateful for both the outpouring of support from giraffe fans around the world, as well as from our professional conservation community, as we continue our commitment to working to protect the future of wildlife,” said Columbus Zoo and Aquarium President/CEO Tom Stalf. According to the International Union for Conservation of Nature (IUCN) Red List of Threatened Species™, giraffe populations overall are listed as vulnerable in their native range across southern and eastern Africa, with several giraffe subspecies being listed as endangered. Giraffe populations are in decline due to various factors, including habitat loss, civil unrest/military operations, poaching and ecological changes. 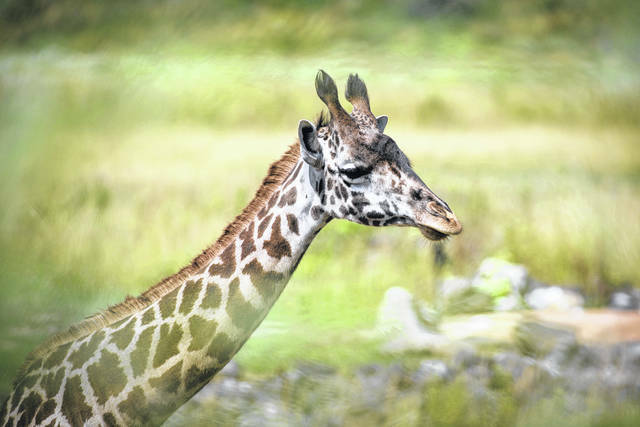 The Columbus Zoo and Aquarium is a long-time supporter of several direct giraffe conservation initiatives and has raised a total of $191,825 for giraffe projects since 2002. The zoo also provided a one-time $56,679 grant to the Giraffe Conservation Foundation through the zoo’s Wine for Wildlife Fund-A-Need. Additionally, the Columbus Zoo and the Cheyenne Mountain Zoo in Colorado are the co-founders of the giraffe plasma bank and, along with several other collaborating zoos, work to consistently collect plasma from giraffe to send to animals in need of a transfusion. With its mission to lead and inspire by connecting people and wildlife, the zoo also remains committed to engaging the public to help increase awareness about these species and the actions we can all take to help protect them.